This is a common question that school communities are asked. People want to know what a school believes in, and they want to understand the school’s approach to teaching and learning. Most schools have a set of shared beliefs — a philosophy of education — that influences what and how students are taught. At Ravenscroft, these shared beliefs help us deliver on our mission of nurturing individual potential and preparing students to thrive in a complex and interdependent world. We believe in a student-centered learning environment, where teachers serve as facilitators and deliver relevant, rich, and rigorous curriculum through a differentiated instructional model. That is a lot of educational jargon! What does it all really mean, and what does it look and feel like in the Lower School at Ravenscroft? Student-centered learning: Students are active rather than passive participants in their learning; what students learn, how they learn it, and how their learning is assessed are all driven by students’ needs, interests, and abilities. Teachers as facilitators: Teachers guide and assist students in learning for themselves by providing resources, strategies, and content; students have ownership and responsibility in the learning process. Relevant, rich, and rigorous curriculum: The content and skills introduced to students will have meaning in their lives and are interesting and challenging. 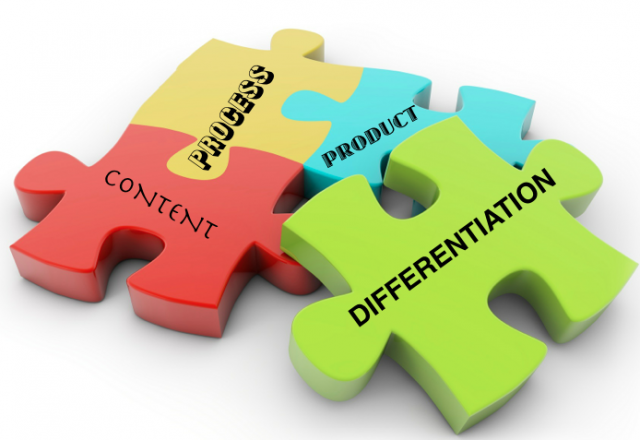 Differentiated instructional model: Teachers adjust their curriculum (what students learn) and instruction (how students learn) to maximize the learning of all students. The first three beliefs are more straightforward, while the idea of a differentiated approach to learning is more complex and is often understood and interpreted differently. At Ravenscroft, differentiated instruction is the way in which our teachers anticipate and respond to a variety of students’ needs in the classroom. Our Lower School teachers are focused on observing and understanding the differences and similarities among our students and using this information to plan the curriculum and instruction. Our model of differentiated instruction is a direct contrast to a traditional learning approach where all students learn the same thing, in the same way, at the same time, and in the same setting. We do not believe a “one-size-fits-all” approach maximizes the learning for all students and helps them reach their full potential. Before beginning a unit of study, students take a pre-assessment to determine what they already know and can do in relation to the identified content and skills. The teacher uses the information from the pre-assessments to plan instruction and create flexible learning groups. Whole group mini lesson: The entire class is gathered together for direct instruction from the teacher that is targeted at the grade-level expectations. Small group work with and without the teacher: Groups of students work together on the content and skills at their academic level; the mini-lesson is reinforced or extended based on the level of the group, and the teacher rotates between the different groups. Individual conferences with the teacher: Students meet individually with the teacher to discuss and target specific areas for reinforcement or extension. Independent work: Students work on tasks and learning activities that have been designed specifically for their individual needs, interests, and abilities; this component often uses technology resources to leverage this independent work time. Whole group share and reflection: The entire class is gathered together to discuss what they learned as individuals and as a group during the workshop. *Not all components occur during every workshop. To truly understand and appreciate how our reading, writing, and math workshops utilize a differentiated approach to learning, you really need to see it in action. One common misconception about differentiated instruction is that every child will have an individualized curriculum. We want to make sure parents do not expect to see 20 different curriculum paths in our classrooms. In general, there are three to five flexible groups, meaning groups can change at any time based on how students progress and respond to learning, and these groups are designed within the units of study that students will explore together. During this whole process, teachers are constantly gathering information about students through the use of ongoing formative (before and during learning) and summative (after learning) assessments. It is complex and nuanced work that our teachers do each day with and for their students. It takes time, patience, and intention to do this important work well. Our Lower School teachers are AMAZING! Our top priorities are to know our students well, care deeply about them as individuals, and empower them to take ownership of their learning journey. Our shared set of beliefs helps position our students to be the best version of themselves and prepares our Ravens to SOAR!